Grilling season is approaching quickly, and soon families in Northern, VA will be outside on their decks enjoying themselves grilling and relaxing with friends, neighbors, and other family members. Are you looking outside at the appearance of your deck and noticing signs of cracking, warping, and splintering? 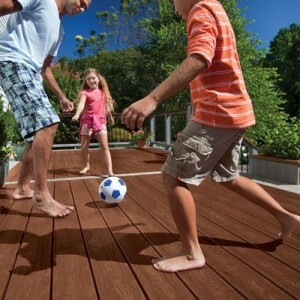 Are you thinking about the many days ahead trying to get your deck ready for the summer months? Are you dreading the tedious task ahead of having to scrub, sand, and stain your deck, yet again, to make it presentable to entertain? Composite deck builders in the Northern, VA area offer you a solution to endless deck maintenance and the solution is eco-friendly too, which means there is no negative impact on the environment. Composite decking materials are made from recycled plastic (milk jugs, shampoo bottles, grocery store bags, and laundry containers) and wood scraps (scraps from window frames, door frames, and other lumber). Tons and tons of wood and plastic are being diverted from our landfills every year to manufacture composite decking which means less waste sitting in our landfills. The manufacturing process of composite decking is virtually waste-free and contains no toxic elements as opposed to wood which is pressure treated by injecting the wood with chemicals that later cannot be burned or recycled. A Northern, VA composite deck builder can take your deck that is in despair and replace it with a deck that is functional and beautiful and above all, maintenance free. A deck is an extension of your home and acts as a playground, kitchen, sanctuary and an entertainment hub for you, your friends and family. By hiring a composite deck builder to replace your old deck with a new composite deck, you can enjoy the years that follow by never having to fuss about spending so much time sprucing up your deck to prepare it for another summer. Composite decking is reasonably priced; especially, when you consider your labor and cost each year scrubbing, power washing and staining your old wooden deck, and it is eco-friendly too. Call a composite deck builder in Northern, VA today and you can be enjoying a new maintenance-free deck soon. This entry was posted on Thursday, March 3rd, 2016 at 5:17 pm	and is filed under composite deck. You can follow any responses to this entry through the RSS 2.0 feed. Both comments and pings are currently closed.